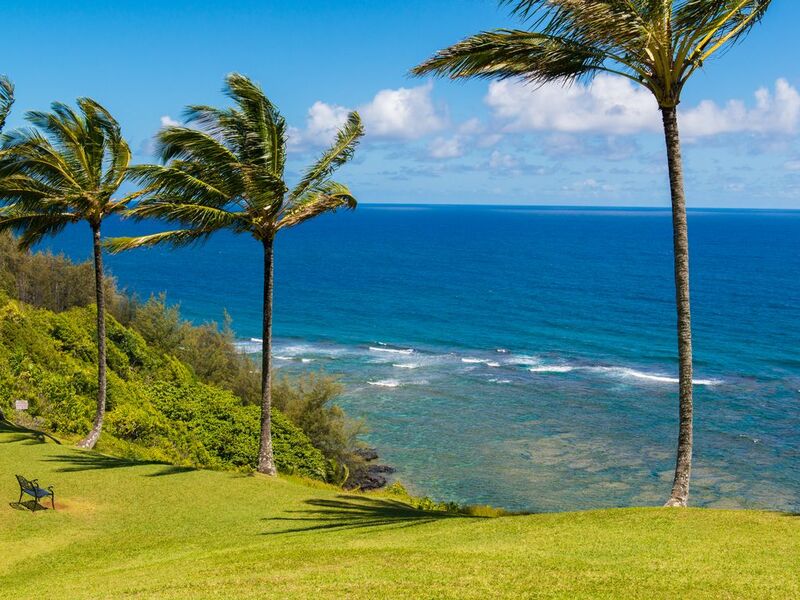 Ci troviamo a Princeville, Kauai su un prato ben curato collinetta con vista sull'oceano dal lanai, salotto e camera da letto. A pochi passi è un sentiero che conduce al tuo caletta isolata. Questo è il luogo perfetto per rilassarsi al sole e fare snorkeling lungo una barriera corallina impressionante brulicante di molti colorati pesci tropicali nativo per le isole. Sei un giocatore di golf? Il principe e il Makai sono due campi da golf emozionanti che circondano la nostra posizione. Tornare al condominio e preparare i pasti nella nostra cucina ben attrezzata o se si sceglie, cenare in uno dei tanti ristoranti della zona. Di notte si addormentano al suono rilassante delle onde che si infrangono sulla riva. Inoltre abbiamo Netflix come funzionalità aggiuntiva. Nella stagione invernale, la fine di dicembre a marzo, guardare le balene migrano proprio di fronte al nostro posto. Paradiso è più vicino di quanto si pensi. Venite a visitare Kauai presto. We were totally satisfied with these accommodations. The owners, Jim & Ricki were welcoming, personable, helpful, and always available. The unit is on a spectacular ocean bluff location with glorious views and sound of the surf below. Looking East, the Kilauea lighthouse make a marvelous backdrop to sunrises. Equally magnificent sunset views abound throughout the area. Princeville is a convenient area to leave the vehicle parked and walk or bicycle. Shopping, Dinning, Sightseeing, and entertainment is located nearby. The unit is clean & functional with more than enough kitchen and recreational items. We did make one slight furniture rearrangement Jim & Ricki. We turned the chair and footrest to face the window and take advantage of those wonderful views. (And whale watch). I would have no hesitation returning to this unit or recommending it to others. Thanks again Jim & Ricki. Great base for my husband and I for 4 days on the North Shore. Loved going to sleep each night with the windows open and waves crashing. Condo had everything we needed. Only reason for 4 stars is it could use a facelift. But, this would not deter us from staying here again in an instant. Jim was a great host and very prompt in communications. Thank you!!! What a perfect place to spend our 30th Wedding anniversary! It was exactly what we had hoped for. The condo was perfect that it had everything we needed, fantastic views and privacy. Jim was very helpful and responded quickly with our needs and we were well prepared in advance for his helpful tips and recommendations. Thank you for extending your hospitality and we hope to be back soon. It was hard to sleep when we got back home since we were used to hearing the ocean sounds nightly. LOL! Beautiful view and most gracious hosts. Thanks Jim and Ricki! Nice location, but it is a downstairs condo so there was noise from upstairs, and there was some very windy weather so there was a lot of noise from that also. Fabulous view. I would recommend this property. The ocean view from the all rooms in this condo are incredible. The condo is functional with a nice queen bed and well-equipped kitchen. The washer and dryer are top-notch. The owner was quick to respond to a question I had about the unit.